This article has been compensated by PAM Cooking Spray. All opinions are mine alone. If you live near the Smoky Mountains, you can’t let Autumn slip away without making an annual trip to the Apple Barn and Cider Mill in Pigeon Forge for fresh apple cider and a family-style meal in the old farmhouse. Each table is greeted with big basket of warm apple fritters and apple butter — one of my very favorite Fall treats! I decided to try adapting the Apple Barn’s recipe for fritters to make Apple Fritter Waffles…you’re welcome, by the way. They’re so easy and so delicious! Making the fritters into waffles was much easier than deep frying. 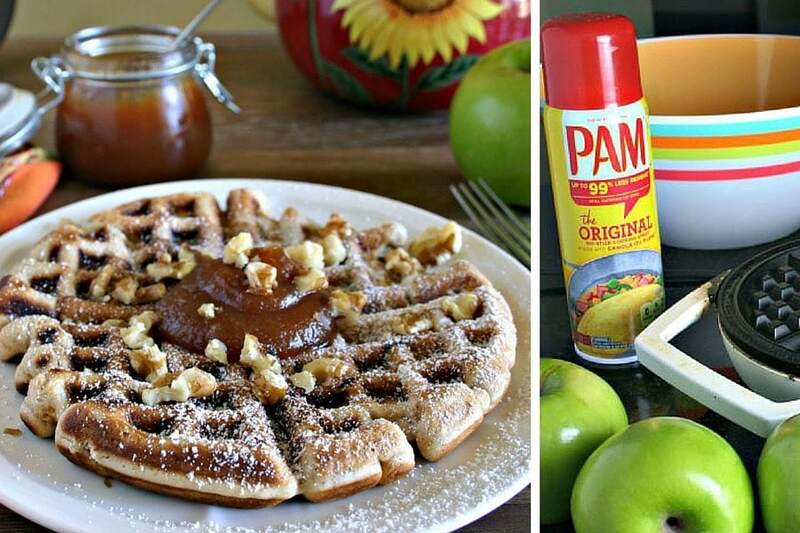 Start with a few basic ingredients, a waffle iron coated with PAM Cooking Spray, and of course Granny Smith apples. You must use Granny Smith’s for any apple recipe–they are the best type for cooking, tart and firm. This fritter-waffle batter is made with cake flour which results in a very nice texture. Whisk together all the dry ingredients (flour, sugar, spices, etc.) in a large bowl, then stir in the wet ingredients and apples just until moist. Quick and simple! 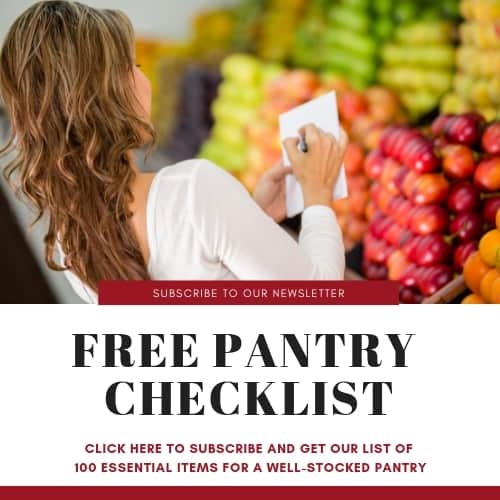 Cook the waffles on a hot waffle iron. 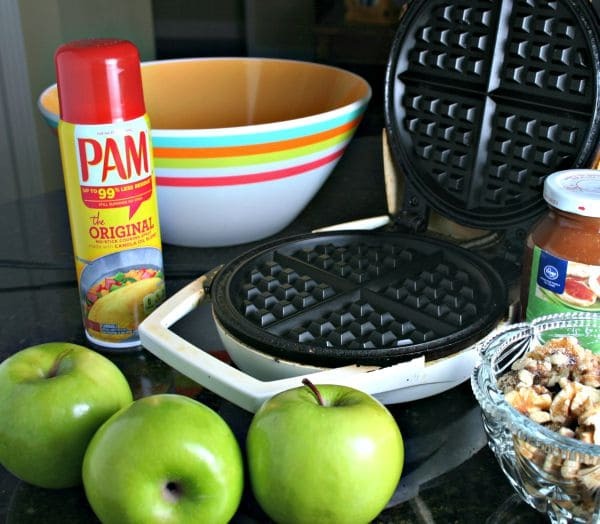 Be sure to coat the surface of the waffle with PAM Cooking Spray for easy removal. PAM Cooking Spray leaves *99% less residue than margarine or bargain-brand cooking sprays too. 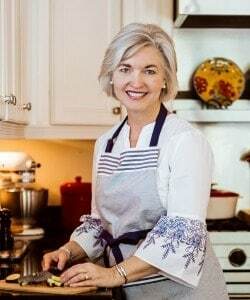 (* vs. leading cooking sprays (except olive oil), after spraying on glass bakeware, baking at 400°F for 30 min, cooling, and then washing in standard home dishwasher with detergent and repeating 4 times). Beware — these waffles smell amazing while when they are cooking. I love the combination of fresh apples and cinnamon, especially when cooking or baking. 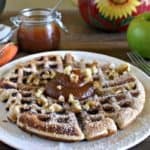 While the waffles are still hot, sprinkle with powdered sugar and serve with a spoonful or two of apple butter and a sprinkle of chopped walnuts. These waffles are so good that I can’t decide if they should be served for breakfast or for dessert! Happy Fall, Y’all! 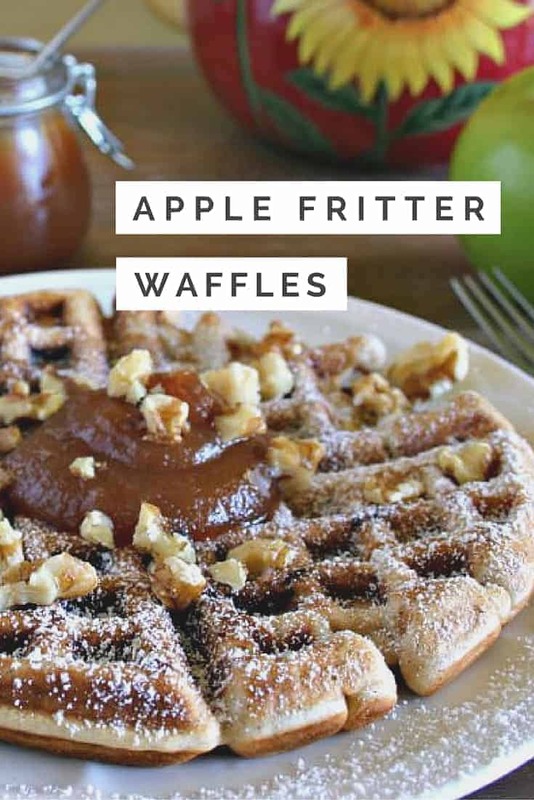 One of my favorite Autumn treats -- Apple Fritters -- are reinvented in these amazing Apple Fritter Waffles. Top with fresh apple butter and chopped walnuts. 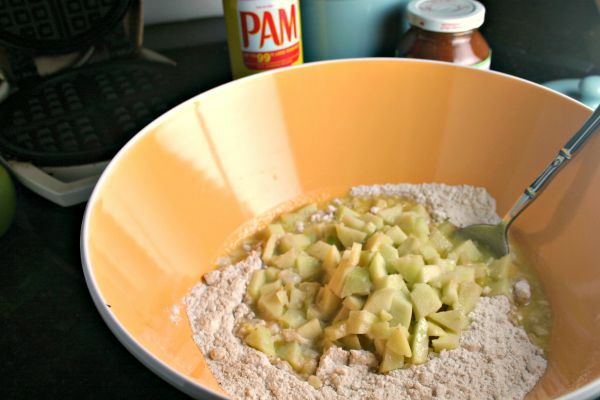 In a large bowl whisk together cake flour, sugar, baking powder, salt, and the spices. In another bowl combine milk, egg, butter, and vanilla. Stir in apples. Pour mixture into bowl with the dry ingredients and stir just until everything is moist. Spray the waffle iron with PAM Cooking Spray. Pour 1/2 cup of batter onto hot waffle iron and close lid. Cook until waffle is golden and cooked through. Remove to a plate and sprinkle with powdered sugar. Serve with 1 to 2 tablespoons apple butter and chopped walnuts, if desired. Recipe adapted from the Apple Barn Cookbook. My husband is such a fan of apple fritters that I know he’d go crazy for these waffles! Melanie, I believe he for sure would! I totally had an idea just recently for a waffle like this! There is seriously nothing better than a sweet breakfast to start your day. Great minds think alike, right? Haha! I made these for breakfast this morning. They were lovely. I did use 1/4 cup sugar instead of half because I couldn’t see giving my kids that much sugar for breakfast. Thank you for the recipe, and I’m sure I’ll make them again sometime. These waffles look so lovely! Apple fritters without all the hassle of deep frying…love it!